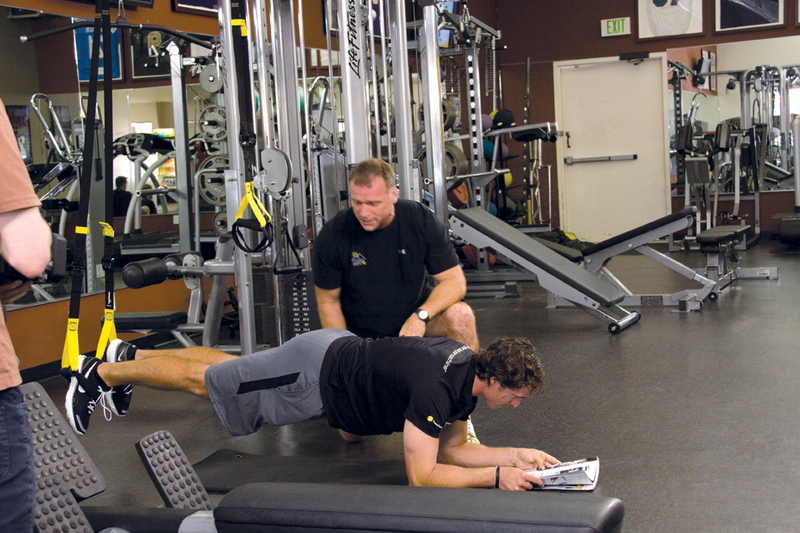 This article is courtesy of the Total Gym Inside Blog. 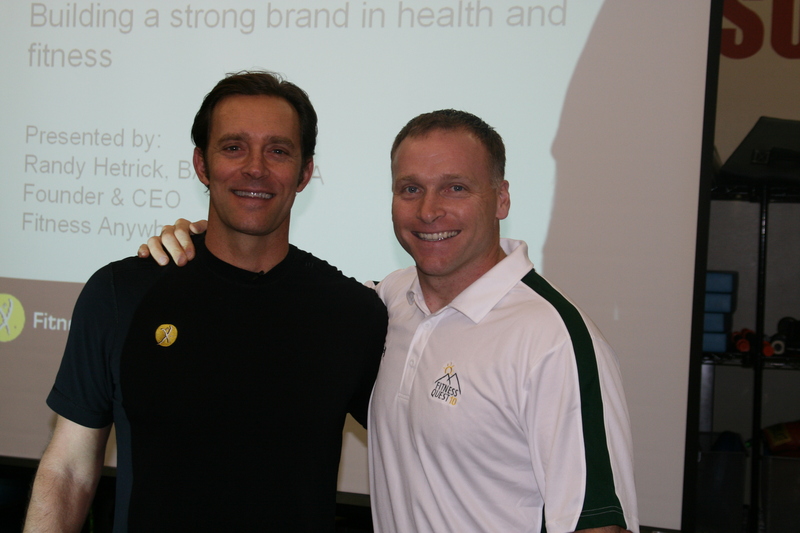 Todd is a recognized performance coach, personal trainer and motivational speaker with a heavy-hitting client roster that includes NFL players Drew Brees, Kellen Winslow and LaDainian Tomlinson as well as Chris Young, Tony Gwynn Jr., and Tim Stauffer of the San Diego Padres and Olympic snowboarding champ Shaun White. To find out Todd’s Exclusive Tips, CLICK HERE. 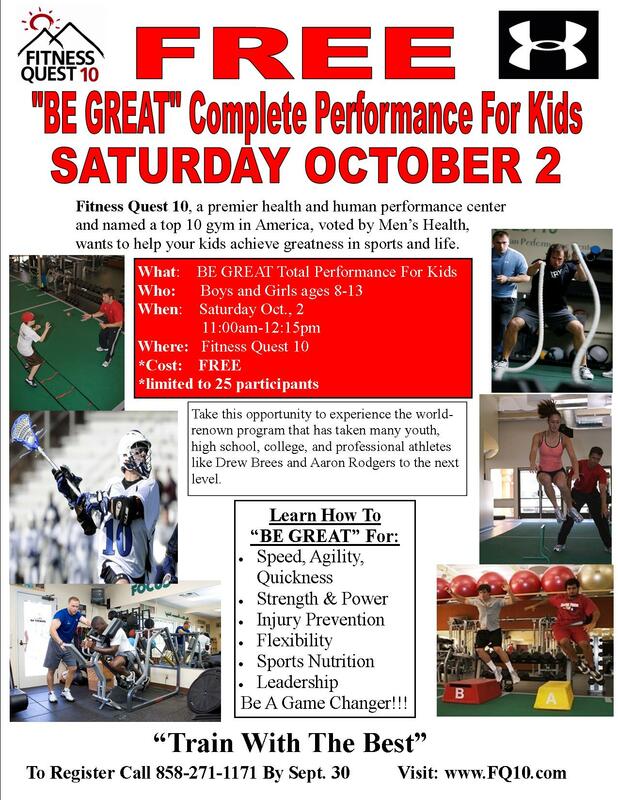 FREE “BE GREAT” Complete Performance Program for Kids on October 2nd at Fitness Quest 10. 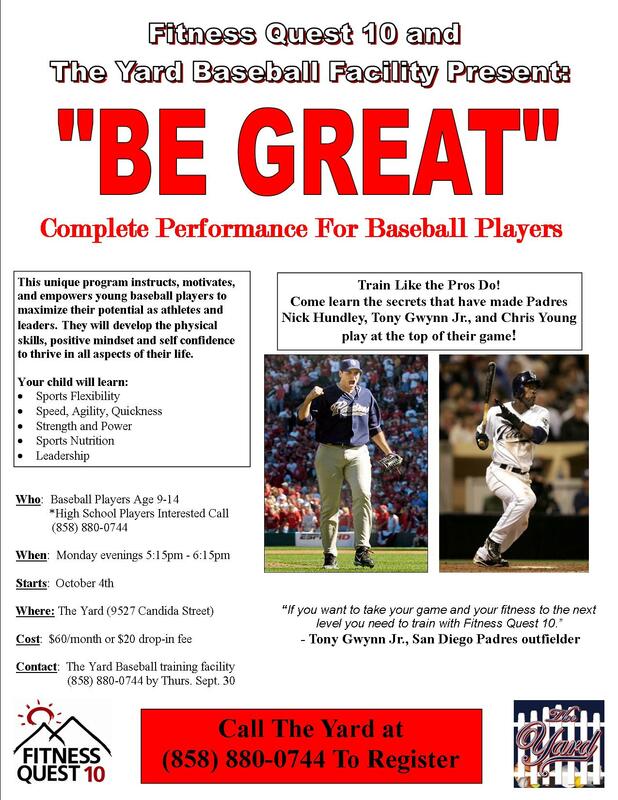 Boys and Girls age 8-13 are invited to attend this FREE opportunity to learn how to “BE GREAT” not only in sports, but in life. The camp is October 2nd at 10:00am-11:15am. Space is limited to the first 25 youngsters to register. Call (858) 271-1171 to register. Figure out the time that your brain is most awake. We all had those friends who rushed to complete their homework in homeroom before school started; but for some, mornings may the best time to get work done. If you’re always exhausted and feeling a little brain-dead after school and practice, get to bed early and wake up sooner than you normally would to give yourself more time to finish assignments before you head off to school. Procrastination seems to be a bad habit we all develop in our teen years. It never pays off. Instead of ignoring an assignment until the night before, work on it in small doses. Consistently working on little pieces of a big assignment will help to ease the stress of its completion. It will also help you to look at things with fresh eyes and do a better job than if you cram and do all the work the night before. Some of us prefer to work alone, but as you know from sports, things can get done more efficiently with the help of your team. This can also be true for school work. Find someone you know you can work well with and set up times to work on assignments together. This way you will have something to look forward to come study time and also someone to help you out. At SportsForce, we work hard to highlight your athletic achievements by showcasing your video. But as many of you already know, academics is equally if not more important in the recruiting process. Don’t put your schoolwork on the backburner. Think of all the time you devote to athletic training and work to put in at least the same amount of time towards your academics. Seeing a strong student-athlete is a great selling point for college coaches. This is a tip that can be applied to both high school and college student-athletes. There is absolutely no shame in going to a teacher or tutor for extra help; that’s what they are there for. In classrooms not everyone is going to be on the same page in understanding the material. If you feel lost, ask your teacher to meet with you to get extra help. You will absolutely benefit and teachers will appreciate the initiative you put in. You probably prep for football season by hauling out your lucky jersey and making sure there’s a six-pack in the fridge, but the guys on the field have done a heck of a lot more than that. 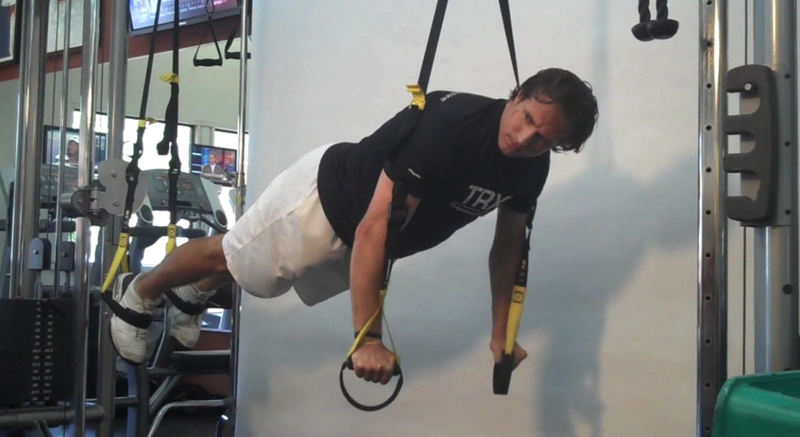 To find out what it takes to move the chains, we asked Todd Durkin — who trained more than 30 NFL players, including Drew Brees, at his San Diego gym this summer — what goes into a workout. “It’s feet to finger tips,” he says. Before they do anything else, they’ve got to get cozy with a foam roller. They use the firm cylinder to perform self-myofascial release, a technique that helps get out the knots, allowing the body to have a wider range of motion. Then it’s time for the dynamic warm-up. “It’s skipping, hopping, jumping and lunging, and it’s often done barefoot,” says Durkin, who likes to make sure every muscle is wide awake. That segues into agility drills, such as running or leaping around cones and bounding on one leg back and forth over a line. Tired yet? No reason to be ashamed. “A lot of my athletes in the first few weeks don’t even get to weights,” says Durkin. But if they still have any energy, it’s time to string exercises together into supersets, which always work complementary parts of the body. Durkin, a former pro who was also a quarterback at William & Mary, blames the injuries that plagued his career on training just what he calls the “mirror muscles.” “You can’t forget about your back,” he adds. Expect 4-6 circuits per workout. That’s what Durkin calls the last gasp before hitting the showers. “Imagine that it’s the fourth quarter, with two minutes to go. You still need mental focus,” he says. So he might throw cards in the air and the players have to catch them in one hand. Or, they’ll need to finish up with three sets of treadmill sprints. He can always dream up something to test even the toughest players in the league. “You never want to believe you’re on the top,” Durkin says. “I’ve got to keep my guys hungry.” And after all that training, they’re ready to devour anyone who gets in their way. You are so stressed out and busy that your sleep is either long and restless or solid but way too short. So you wake up and start pounding coffee to get going. There’s no time to eat so by the time you get around to it you are starving. Hunger in combination with the elevated stress hormone cortisol cause you to crave foods high in sugar, fat and salt. Poor sleep, caffeine side effects and blood sugar imbalance from poor nutrition leave you feeling tired, moody and unable to concentrate. Cut out the caffeine after 2pm. OK, I know that I just lost half of you! I’m not saying get rid of it all together, just switch to decaf in the afternoon. Caffeine stays in your system for 6 hours, so even if you are one of the people with a caffeine tolerance it will negatively affect your sleep. Increase your B-vitamins. B-vitamins support the entire nervous system as well as our stress response. They also aide in energy production so you will feel a natural increase in energy. Food sources include: liver, soy, broccoli, beans, lean meat, sprouted grains, salmon, nuts and eggs. You can also supplement with a B-50 complex found at your local health food store. Always take B-vitamin with food and don’t freak out when your urine turns neon yellow! Make sure everything you eat contains protein. Protein supports brain function, which in turn impacts mood, behavior and concentration. It will also give you sustained energy and decrease sugar cravings. No need to go Atkins with your protein (in fact, please don’t! ), instead just include some protein with every meal. Food sources include: fish, meat, eggs, nuts & seeds, tofu, dairy, soy, beans and rice. Add in some Magnesium. Magnesium is a natural muscle relaxer. Not the kind that causes you to speak gibberish and pass out, but the kind that helps pull your tense shoulders from your ears and quiet your mind so you can sleep. It is also one of the minerals that Americans are most deficient in. I recommend supplementing with a high quality Calcium/Magnesium Citrate before bed. It will also help with muscle soreness from all the exercise you may be doing to relieve stress! Here’s to leading a calmer, happier life! Tara Coleman is a Clinical Nutritionist living in San Diego, CA, and the newest spokesperson for Salada Tea. She will guest blog on Total Gym Inside twice a month with “Tara’s Friday Bite.” Leave us your comments with ideas for future topics or email Tara directly at tara@taracoleman.com.